First of all I would like to thank and apologize BlogAdda. I would like to thank BlogAdda because the book was sponsored by them and secondly apologize because I have kept them waiting for a long time. Being a student, it gets little difficult to manage things and complete them on time when you are in grade 12! 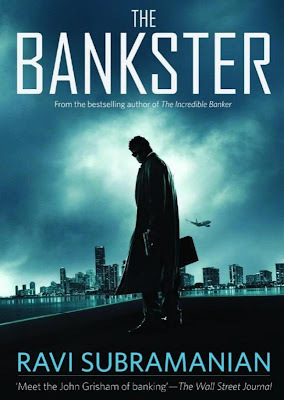 Okay lets keep that aside, before beginning lets us know Mr. Ravi Subramanian who is the author of The Bankster. Ravi Subramanian an alumnus of IIM Bangalore, has spent two decades working his way up the ladder of power in the amazingly exciting and adrenaline-pumping world of global banks in India. It is but natural that his stories are set against the backdrop of the financial services industry. He lives in Mumbai with his wife Dharini and daughter Anusha. In 2008, he won the Golden Quill Readers Choice award for his debut novel, If God was a Banker. Lets Begin from the first page itself which is the cover page. For a newbie in the novel worlds, the first thing he/she looks in a book is the cover. Well stop, I am not telling each and every newbie does that, but when I entered the world of novels, I had some related thought!. I would like to congratulate Ravi for designing a awesome cover-page which instantly grabs one's attention. The color combination is perfect and looks professional unlike most of the novels which are coming these days. I would like advice you to grow some nails before beginning this book because this book is an absolute thriller and will offer you some nail-biting moments. The author being a alumnus of IIM, I would say he has effectively used his expertise over his topic. The narration is good and keeps your fingers turning the page. The book features two parallel stories. First one is about a Multinational Bank in India called the Greater Boston Global Bank or the GB2. There are series of deaths of the employees of the bank which first seems to be either accidents or suicides but there is a conspiracy going on. Secondly there is a protest going on in Kerala over a Nuclear Power-plant. The stories have been brilliantly weaved together. I would have written more about this book, but this book being a thriller deserves a read from your side rather me spoiling the the experience of the mind blowing book by disclosing everything about this book. Finally I would like to thank and congratulate Mr Ravi Subramanian for the awesome novel and also for the signed version. Please share your experience with the book through the comments section.